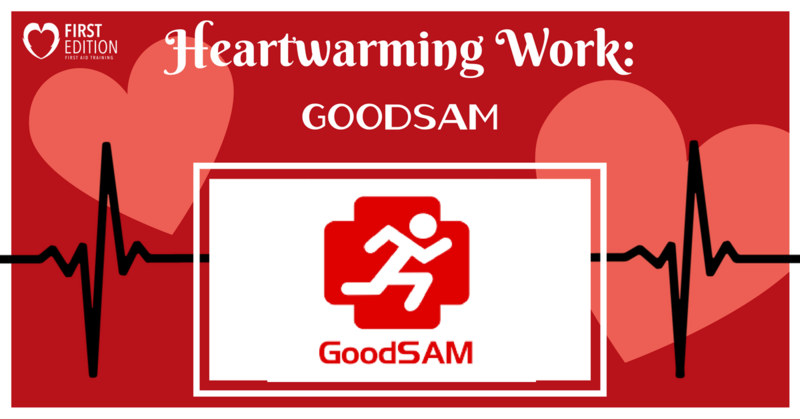 Heartwarming Work – GoodSAM - First Edition First Aid Training Inc. The team at First Edition First Aid Training is always looking for new and improved ways to increase AED awareness. That is why we created an AED awareness campaign called #FindAnAED to improve public safety and preparedness. In addition to this, we are excited about another heartwarming opportunity called GoodSAM – an app that stands for ‘Smartphone Activated Medics’. Check out how this app is making a big difference in the UK, Australia, and New Zealand! Over 19,000 volunteers and 40,000 trained and trusted responders are registered, and the app is working towards building up that number even more! The GoodSAM app offers a new and innovative way to stay prepared and offer immediate assistance when heart health is at risk. 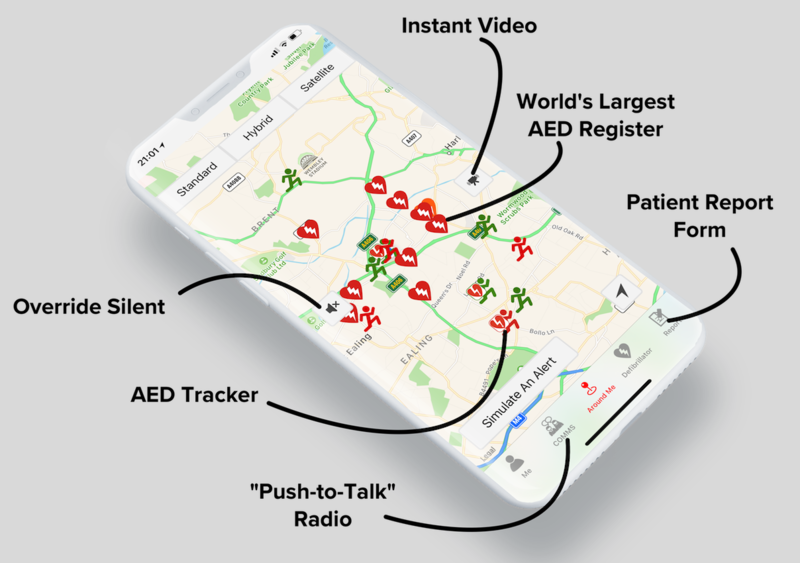 The more people that download the app, the more aware the public will be about nearby AED locations and responders. The GoodSAM app is all about providing support. By connecting to thousands of trained and certified professionals, as well as volunteers, getting immediate assistance is possible. As stated on the website, “You’ll be alerted when you are in the immediate vicinity of a cardiac arrest, so that you can start CPR or basic first aid in the critical minutes before the emergency services arrive.” Every time someone downloads the app, the chances of survival will increase for those who may experience a heart-related incident. And Sharing with your followers! Get First Aid Training so you can jump into action with confidence if an emergency occurs – wherever, whenever. If an emergency occurs and no one nearby knows how to help, it could be too long before medical assistance can arrive. With the help of apps like GoodSAM, nearby individuals can be alerted to come to the aid of others. In order for this app and other AED awareness campaigns to work, it requires the help of the public. When involved, the public will become more aware and will continue looking for locations that have an AED so they can share them with others. When we are aware of these AED spots, we have the knowledge to stay prepared and help out! It all comes back to the heart, and that is why we support the GoodSAM Apps for their work in providing opportunities to help in cardiac arrest emergencies. 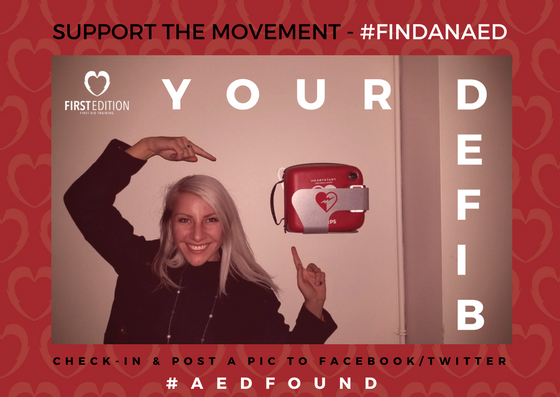 Create further AED awareness and speak to locations near you to see about getting an AED installed. Together, let’s create further AED awareness and increase public safety!